System identification is the process of obtaining descriptions of dynamical systems based on the analysis of experimental observations. This chapter presents, in sufficient detail to allow a numerical implementation by the interested reader, an algorithm for identifying a state space description of a time invariant system that behaves linearly. 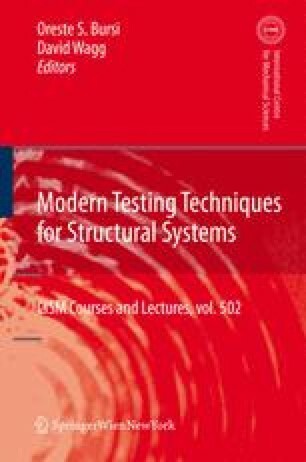 The chapter begins by clarifying the connection between the discrete time models that are identified from sampled data and the underlying continuous time physical systems. The (formal) connection is shown to be strictly related to the assumed parameterization of the excitation in the inter-sample and it is noted that the commonly used zero order hold premise (constant load within the sampling time), ubiquitous in control applications, is usually suboptimal in off-line identification. Specifically, it is contended that accuracy in the transfer from discrete to continuous time can be promoted by operating on the premise that the input is a band limited function. The notions of controllability and observability, which relate the sensor deployment to the modes that can be identified from observations, are discussed following the discrete to continuous transfer section. The central part of the chapter examines the extraction of pulse response functions for multiple input multiple output testing setups and the use of these functions in the formulation of a discrete time state space model by means of the Eigensystem Realization Algorithm. The chapter continues by illustrating the connection between the realization matrices and the modal properties of the system, i.e., modal frequencies, damping ratios and mode shapes. The need to separate system modes from modes that appear in the computations due to inevitable approximations and sensor noise is also discussed and some specific guidelines to discriminate between the two are given. The identification part of the chapter closes with an introduction to the identification of systems where the excitation signals are not deterministically known. An appendix presenting a technique to localize damage in structural or mechanical systems from changes in realization results concludes the chapter.